Today we would like to talk about a cute story. 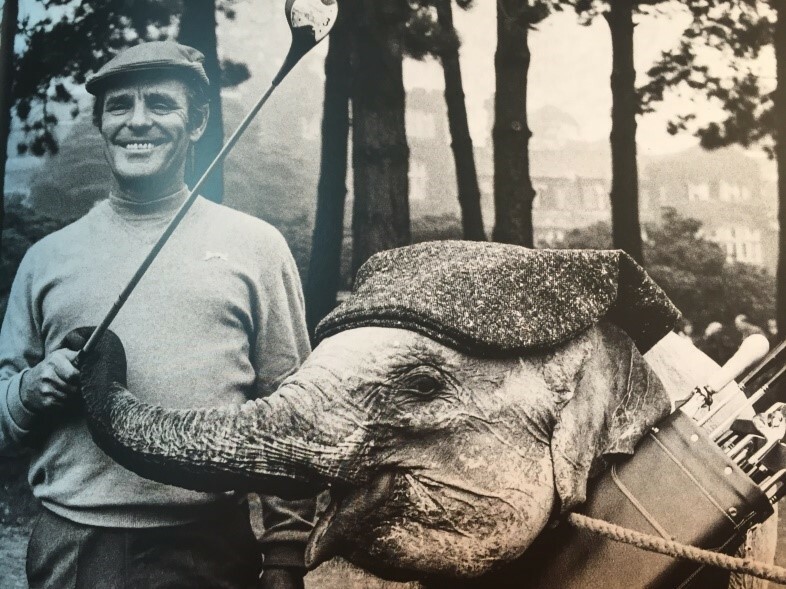 It’s about the famous golfer Dickie Henderson and his lovely pet: the elephant Mini. We can see several pictures of our favorite duet in “The stylish life; Golf” a Coffee table book which showcases Dickie Henderson wearing a slazenger jumper with a vintage logo v-neck. 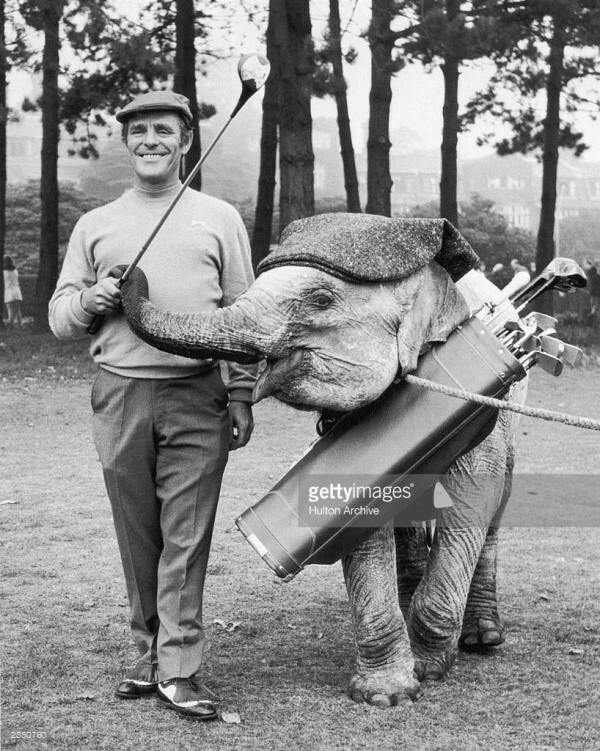 Comedian Dickie Henderson (1922 – 1985) played a round of golf at Selsdon Park, Surrey, with Mini the Indian elephant, his co-star in the upcoming TV series ‘A Present For Dickie’ – 6th October 1969. They lovely couple used to appear with a golf jumper, and always combined. Consequently, everybody loved them because he was a very English entertainer. 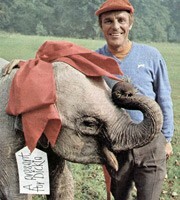 Probably, the main character in question was an elephant called Mini, which ends up living inside Dickie’s house. Seems like chaos was ensured as Dickie tries to keep Mini hidden from friends and foe who visit him. Dickie started in his own ITV television programme: The Dickie Henderson Half Hour in 1958 and a series of A Present For Dickie. He was a keen golfer and he enjoyed most of sports. He was a leading Water Rat and was awarded the OBE, in recognition of his charitable work. We found this charming image of Dickie wearing the same Slazenger v-neck chose by Jack Nicklaus. As a result, he was an icon that took into account that garment dress for seventies golf nostalgic. Finally we would like to say that our favourite pictures of all the times, is this one where Dickie pose with Mini with his Slazenger Jumper while they practice golf.